Chip Somodevilla/Getty ImagesSarah Huckabee Sanders. White House press secretary Sarah Huckabee Sanders said the indictment of President Donald Trump’s former campaign chairman Paul Manafort did not prove that the Trump campaign colluded with Russia during the 2016 election. The White House instead tried to make the discussion about Hillary Clinton’s campaign’s funding of a dossier containing negative information about Trump. 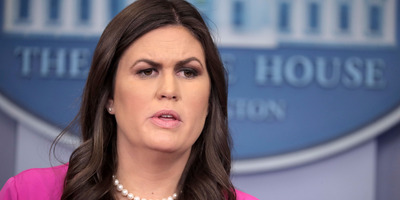 White House press secretary Sarah Huckabee Sanders deflected from news of the indictment of top 2016 campaign associates of President Donald Trump, instead blaming Hillary Clinton. During Monday’s press briefing, Sanders argued that the indictment of former campaign chairman Paul Manafort and his business associate Rick Gates did not reflect poorly on Trump, and claimed instead that people should be focused on Hillary Clinton’s campaign’s partial funding of a salacious dossier with negative information about Trump. “The real collusion scandal, as we’ve said several times before, has everything to do with the Clinton campaign, Fusion GPS, and Russia. There’s clear evidence of the Clinton campaign colluding with Russian intelligence to spread disinformation and smear the president, to influence the election,” Sanders said. Over the past several days, conservative allies of the president have attempted to deflect from a pending indictment in the investigation by special prosecutor Robert Mueller, reviving old 2016 campaign attacks on Clinton. Other Trump allies on Monday also distanced Manafort from Trump.